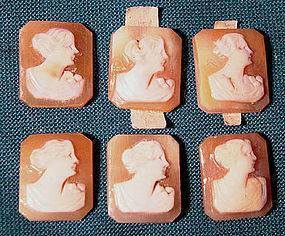 A set of six matching hand-carved unset shell cameos depicting a woman, perfect for a bracelet or necklace. They measure on average 5/16" x 7/16" and they dates to the 1930s. Two of them have their original MADE IN ITALY stickers - they are old store stock from a jewellery store that closed many years ago. They are all in the less common rectangular shape. They are in excellent condition with no chips, cracks, losses, damage or repairs. All items are thoroughly and conservatively graded and all condition issues are noted; all items are vintage or antique and may have slight signs of gentle use. Light packet air shipping to the U.S. starts at $4.75 (other spots may vary, tracked and insured is higher). Items paid with a credit card will be shipped to confirmed addresses only. We do ship internationally. All of our prices are in $US. PLEASE NOTE: we DO NOT accept PayPal, only VISA and MASTERCARD. A 10k yellow gold Edwardian 13-1/4" man's watch chain circa 1910-15. 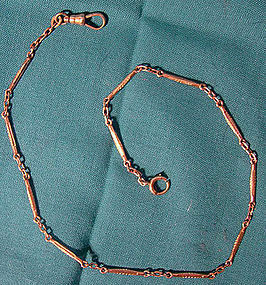 This antique gentleman's watchchain has a swivel and a spring-ring catch, and it is stamped 10K ECCO. It weighs 6.7 grams, and it is in excellent condition with no dents, bends, corrosion, losses, damage or repairs. All items are thoroughly and conservatively graded and all condition issues are noted; all items are vintage or antique and may have slight signs of gentle use. Expedited tracked insured air shipping to the U.S. starts at $22 (other spots may vary). Items paid with a credit card will be shipped to confirmed addresses only. We do ship internationally. All of our prices are in $US. NOTE: we DO NOT accept PayPal, only VISA and MASTERCARD. 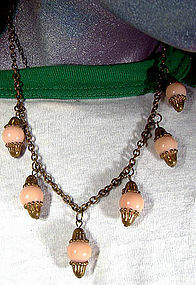 A brass and rose coral celluloid dangle necklace 1930s. This 16" necklace has six 1-1/2" drops and it has a hook and eye catch. It is in excellent condition with no chips, cracks, dents, bends, corrosion, losses, damage or repairs. All items are thoroughly and conservatively graded and all condition issues are noted; all items are vintage or antique and may have slight signs of gentle use. Tracked Packet shipping to anywhere in the U.S. is $14.00 - this includes online tracking, air service and insurance up to $70. Items paid with a credit card will be shipped to confirmed addresses only. We do ship internationally. All of our prices are in $US. PLEASE NOTE: We DO NOT accept PayPal. An Art Deco 14k & 18k diamonds ring circa 1930s. 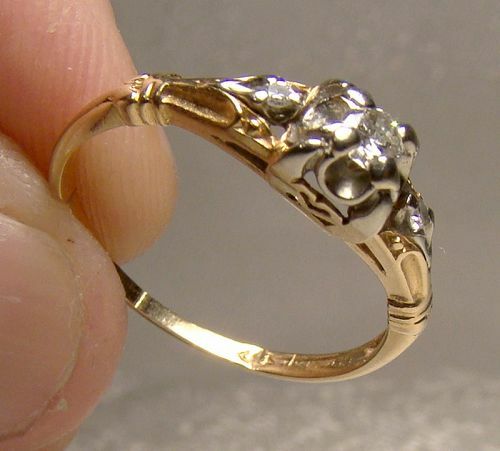 This vintage size 6 ring features a central brilliant cut 9-10 pt. diamond (by gauge) with two approximately 2 point each brilliant flanking diamonds. 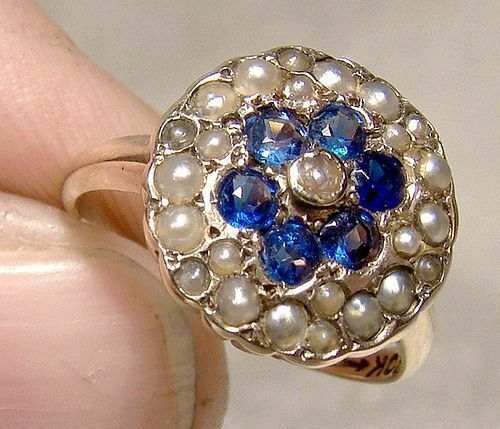 This ring measures 7/16 x 1/4" across the diamonds, it weighs 1.5 grams, and it is stamped 14K - 18K with an obscured maker's mark (the ring has been sized at some point in the past). The claws are all present and appear to be in excellent shape. The diamonds are clear and clean looking, no visible inclusions, clouding or damage (there was a little surface dirt that was missed before photos on the large stone, has been since cleaned off). This item is in excellent vintage condition with no chips, cracks, dents, bends, corrosion, losses, damage or repairs. All items are thoroughly and conservatively graded and all condition issues are noted; all items are vintage or antique and may have slight signs of gentle use. Expedited tracked and insured parcel shipping to the U.S. starts at $23 (other spots may vary, air is higher). Items paid with a credit card will be shipped to confirmed addresses only. We do ship internationally. All of our prices are in $US. PLEASE NOTE: We DO NOT accept PayPal. A cool and vintage French Art Deco Bakelite and rhinestone pin c1920s-30s. 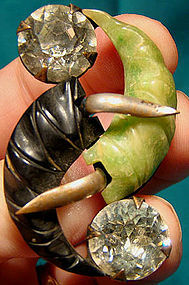 This 2 x 1-3/8" pin features mottled green and black horn-shaped "stones" of carved Bakelite in imitation of jade and onyx; it also has two large claw-set closed-back flashy rhinestones. It has silverplated hooks on the front and a screw-mounted setting with a blackened finish on the back, which has the original c-clasp. It is stamped MADE IN FRANCE, and it is in excellent condition with no chips, cracks, dents, bends, corrosion, losses, damage or repairs othe than the slightest signs of use. All items are thoroughly and conservatively graded and all condition issues are noted; all items are vintage or antique and may have slight signs of gentle use. Surface tracked shipping to the U.S. starts at $16.75 (other spots may vary) - insured is higher, and mandatory on items over $95 if paid with a credit card. Items paid with a credit card will be shipped to confirmed addresses only. We do ship internationally. All of our prices are in $US. NOTE: we DO NOT accept PayPal, only VISA and MASTERCARD. 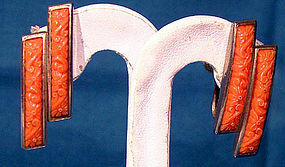 A pair of Art Deco coral celluloid earrings from the 1930s. 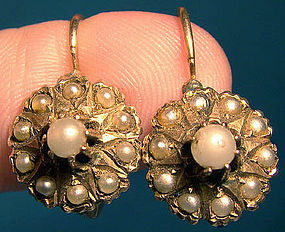 These vintage Art Deco rhodium plated screwback earrings have coral celluloid panels. These unsigned 1-1/4 x 7/16" earrings are in excellent condition with no chips, cracks, dents, bends, corrosion, losses, damage or repairs. All items are thoroughly and conservatively graded and all condition issues are noted; all items are vintage or antique and may have slight signs of gentle use. Tracked Packet shipping to anywhere in the U.S. is $14.00 - this includes online tracking, air service and insurance up to $70. Items paid with a credit card will be shipped to confirmed addresses only. We do ship internationally. All of our prices are in $US. PLEASE NOTE: We DO NOT accept PayPal. A vintage ultra-modern style cast pewter pin by Robert Larin of Montreal. This 2-1/2" x 1" pin has a safety catch, and it is signed LARIN on the back. This item is in excellent condition with no dents, bends, corrosion, losses, damage or repairs. All items are thoroughly and conservatively graded and all condition issues are noted; all items are vintage or antique and may have slight signs of gentle use. Tracked packet air post to the US is $13.95 (other spots may vary). Items paid with a credit card will be shipped to confirmed addresses only. We do ship internationally. All of our prices are in $US. PLEASE NOTE: We DO NOT accept PayPal, only VISA and MASTERCARD. 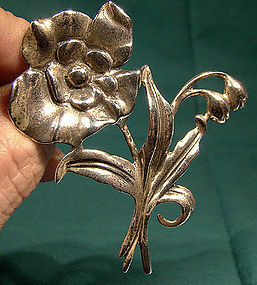 A vintage 1940s Danecraft sterling silver 2-1/4" across flower pin. This cast silver pin has a safety catch and it is stamped DANECRAFT REG. US. PAT. OF. STERL.. It weighs 16.8 grams, and it is in excellent condition with no dents, bends, corrosion, losses, damage or repairs. All items are thoroughly and conservatively graded and all condition issues are noted; all items are vintage or antique and may have slight signs of gentle use. Surface isured shipping to the U.S. starts at $6.75 (other spots may vary) - tracked shipping is higher, and mandatory on items over $95 if paid with a credit card. Items paid with a credit card will be shipped to confirmed addresses only. We do ship internationally. All of our prices are in $US. NOTE: we DO NOT accept PayPal, only VISA and MASTERCARD. 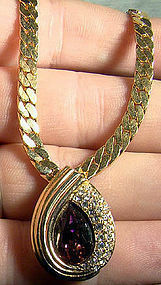 An elegant 17" vintage gold plated signed Christian Dior necklace with purple and white rhinestones c1980s. This necklace features a 1" x 3/4" central drop with a teardrop amethyst coloured foil-backed rhinestone; it has a snap-over catch with an open link extension for length adjustment. It is stamped Ch.DIOR copyright mark on the tag and on the back of the drop. 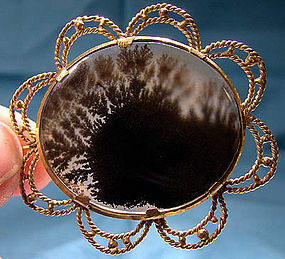 This item is in excellent vintage condition with no chips, cracks, dents, bends, corrosion, losses, damage or repairs. All items are thoroughly and conservatively graded and all condition issues are noted; all items are vintage or antique and may have slight signs of gentle use. Tracked air shipping to the U.S. starts at $16.50 (other spots may vary). Items paid with a credit card will be shipped to confirmed addresses only. We do ship internationally. All of our prices are in $US. PLEASE NOTE: We DO NOT accept PayPal, only VISA and MASTERCARD. A vintage World War II sterling silver United States Air Force Bombardier pin, made by Coro. This 1-3/8" pin weighs 2.7 grams, it has a safety catch, and it is in excellent condition with no dents, bends, corrosion, losses, damage or repairs. All items are thoroughly and conservatively graded and all condition issues are noted; all items are vintage or antique and may have slight signs of gentle use. Small packet surface shipping to the U.S. starts at $6.90 (other spots may vary) - tracked shipping is higher, and mandatory on items over $95 if paid with a credit card. Items paid with a credit card will be shipped to confirmed addresses only. We do ship internationally. All of our prices are in $US. NOTE: we DO NOT accept PayPal, only VISA and MASTERCARD. A vintage 30" natural Russian graduated chunk amber necklace. This necklace features individually knotted chunks of amber measuring from 1/2 to 1" long; it is in excellent condition with no chips, cracks, losses, damage or repairs. All items are thoroughly and conservatively graded and all condition issues are noted; all items are vintage or antique and may have slight signs of gentle use. Surface tracked shipping to the U.S. starts at $18 (other spots may vary) - insured is higher, and mandatory on items over $95 if paid with a credit card. Items paid with a credit card will be shipped to confirmed addresses only. We do ship internationally. All of our prices are in $US. NOTE: we DO NOT accept PayPal, only VISA and MASTERCARD. 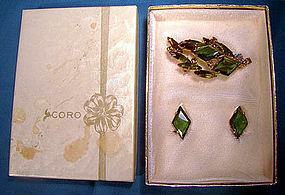 A signed Coro green rhinestone pin & earrings in the original box circa 1960s. It features green, dark amber and aurora borealis rhinestones in pin and matching clip-on earrings and this set in the original box. This set consists of the 2-1/4" x 1-1/4" pin with safety catch and the two 7/8" x 1/2" clip-on earrings. The settings are gold plated, and each piece is unsigned. The original box is gold wrapped cardstock with a textured silk-style top with printed logo and ribbon; it also has the plush fitted interior stage and the stand up original Coro $3.00 price tab. The diamond-shaped stones are open-backed and unfoiled. Delizza and Elster was known to have made pieces for Coro, although we do not know if this is one of those. This set is in excellent condition with no chips, cracks, dents, bends, corrosion, losses, damage or repairs other than some staining and residue on the box top. All items are thoroughly and conservatively graded and all condition issues are noted; all items are vintage or antique and may have slight signs of gentle use. Tracked Packet shipping to anywhere in the U.S. is $14.00 - this includes online tracking, air service and insurance up to $70. Items paid with a credit card will be shipped to confirmed addresses only. We do ship internationally. All of our prices are in $US. PLEASE NOTE: We DO NOT accept PayPal. 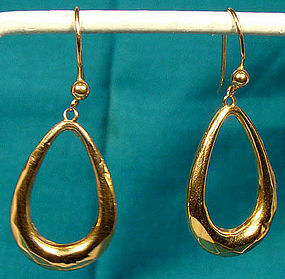 A pair of 9k yellow gold Edwardian hollow-cast hoop earrings c1900-10. These pierced earrings measure 1-1/4" x 11/16" and they are stamped 9CT. They weigh 2.2 grams, they have a typical facetted design at the bottom, and they are in very good condition with no bends, corrosion, losses, damage or repairs other than some minor denting. All items are thoroughly and conservatively graded and all condition issues are noted; all items are vintage or antique and may have slight signs of gentle use. Surface tracked shipping to the U.S. starts at $21 (other spots may vary) - insurance and tracking included in shipping quotes. Items paid with a credit card will be shipped to confirmed addresses only. We do ship internationally. All of our prices are in $US. PLEASE NOTE: We DO NOT ACCEPT PayPal, only VISA and MASTERCARD. 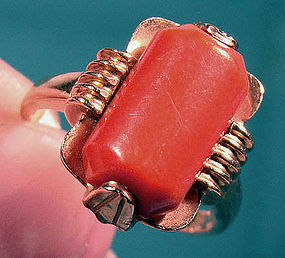 A 14k gold genuine coral ring circa 1940s 1950. 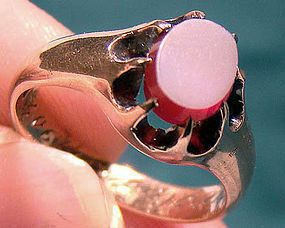 This vintage yellow gold size 5 ring features a claw-set loaf-shaped natural coral stone. I thas an elegant industrial modern lines, and measures 11/16" x 9/16" across the top / upper section. It is stamped JIC and 14K and weighs 4.8 grams. It is in excellent condition with no chips, cracks, dents, bends, corrosion, losses, damage or repairs, but the coral is just very slightly wiggly. All items are thoroughly and conservatively graded and all condition issues are noted; all items are vintage or antique and may have slight signs of gentle use. Expedited tracked insured air shipping to the U.S. starts at $22 (other spots may vary) - insurance and tracking are included in shipping quote. Items paid with a credit card will be shipped to confirmed addresses only. We do ship internationally. All of our prices are in $US. PLEASE NOTE: we DO NOT accept PayPal, only VISA and MASTERCARD.